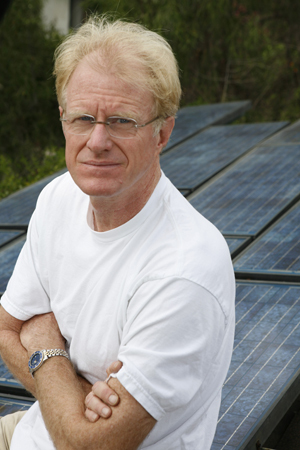 Actor Ed Begley, Jr., has worked tirelessly to protect the environment and spread the word about how to live a green life. From the moment he attended his first Earth Day event in 1970, actor Ed Begley, Jr., has worked tirelessly to protect the environment and spread the word about how to live a green life. Driving his electric car to the Academy Awards and pedaling his bike to TV and film sets around Los Angeles have earned him the title the “greenest man in Hollywood.” Today, his passion for our planet is a living testament to what we can all do to lead the greenest possible lives. AF: You have recently joined the Earth Cinema Circle (www.earthcinemacircle.com) as the host and spokesman. Why do you think movies can make a difference for the planet? EB: Films have influenced popular culture for many years, and historically people have been very well informed by documentaries. Now with a DVD club like Earth Cinema Circle, people can be inspired to become part of the solution, not the problem, by watching these educational, entertaining environmental films. AF: What do you think are five important things everyone should do to help the environment? EB: I urge people to pick the low-hanging fruit. Start small. Ride a bike if weather and fitness permit. Get an energy-saving thermostat. Grow some vegetables or fruit. If you don’t have your own piece of dirt, join a community garden. Replace your light bulbs. Use power strips to avoid “vampire power,” or get the newest technology called a “green switch” so you can hit one switch to turn off everything non-essential when you leave your home. And of course, if you can afford it, get solar panels and an electric or hybrid car. AF: What do you feel is most important for protecting the environment: recycling, energy conservation or green building? EB: It’s hard to pick. Buildings are big energy users and last a long time. It you build them right, they can use a fraction of the energy. Transportation is just as big an issue. You have to get out of your car and bike, walk and use public transportation if you can. Make sure your car is fuel and energy efficient. AF: What are some of your favorite green gadgets or tools? EB: My favorite green gadgets are my little solar chargers. I’ve had them for years. They open up like a fan with several panels on them and will actually charge your cell phone. I also have a solar backpack with an even larger panel that will charge my computer. But my solar oven would have to be my number one favorite green tool. I use it in my backyard to make all of my soups, beans, stews and recipes, all with free energy from the sun. AF: What is your next green home improvement? EB: My home has been hemorrhaging heat in the winter and cool air in the summer, despite my best efforts. Recently some people came to my home with an infrared gun, so I was able to see all the gaps, especially in the crawlspace under the house. I also just got a new 95 percent energy-efficient water heater and a new heating and air unit, both from AO Smith. AF: Tell us about the special insulation in your home. EB: I have recycled denim in the attic and had them blow cellulose into the walls. We have a big demand for energy in my house since we run two businesses on site. Add in my electric car, and although I have a solar house, I need to make sure it’s totally energy efficient. AF: What is your reality show, “Living with Ed” about? EB: It’s a show about my poor beleaguered wife and what it’s like to live with a guy who rides a bicycle to make toast. I am interested in things working well and being practical. She is more interested in the aesthetics. We find a way to meet in the middle. We’ve learned we can have a drought-tolerant garden that is not only practical but also looks good. AF: What films and books about living green do you suggest? EB: I am going to be unabashedly self-serving here. My book, Living with Ed: A Guide to the Eco-Friendly Life, has just been published by Clarkson Potter. It’s a very good how-to book filled with lots of tips. I also tell people to look in the Gaiam and Real Goods catalogues to see all the wonderful books about solar and wind power, and things like straw bale houses. AF: In the current Earth Cinema Circle collection there is a documentary called “A Life Among Whales.” Why is this an important film? EB: This film tells the story of whale biologist Dr. Roger Payne, and the work he has done detailing the intelligence of whales and the near-extinction of the species. It also includes groundbreaking work he did in observing and recording whales singing. He was instrumental in creating a ban on whaling that, unfortunately, is now being dismantled. This film will bring attention to the importance of funding the efforts of Paul Watson (founder of the Sea Shepherd Conservancy) and our friends at Greenpeace. Also on this volume are two films about food. One film is an animated piece from the Sierra Club called “The True Cost of Food” and the other is an incredibly inspiring film called “How to Save the World” about a New Zealand biodynamic farmer. I want to encourage people to join Earth Cinema Circle and watch these films, and then look and see what small things they can begin to do today to make a difference. For more information please visit www.earthcinemacircle.com and www.edbegley.com.